We focused on the lower portion of the Wild Atlantic Way: the Cliff Coast and Southern Peninsulas. Getting to Ireland, however, did not go as smoothly as planned. 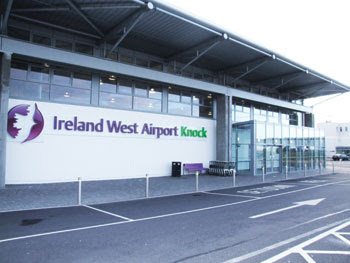 We'd booked an afternoon Easyjet flight from Amsterdam's Schipol to London's Gatwick airport where we were booked on an early evening Aer Lingus flight to Ireland West Knock airport. We've flown Easyjet a number of times and enjoy its budget-friendly service, but it took flight #5 for us to realize all our flights with this airline have been late and our Amsterdam to Gatwick flight was no different. It was delayed not once but twice. Long story short we missed our flight to Knock which meant an unexpected layover at Gatwick and one less day in Ireland. Still, we think it worked out for the best. If not for the delay we would not have gotten as far as Murrisk on day #1 nor would we have stayed two nights at the Bertra House B&B. 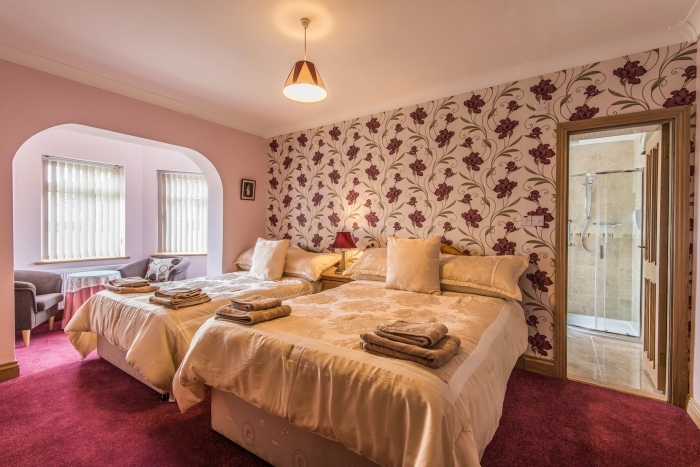 Our en-suite two bed room included a cozy bay window seating area. Margaret, the B&B owner, apologized for our lack of a sea view, but we were quite happy and content with the view of Croagh Patrick and the soothing sound of baa-ing sheep. Often people will say something in passing that is meant to make light of the situation but leaves a lasting impression and Margaret is one of those individuals. She told us about a recent conversation she had with a Booking.com agent who insisted she must do something to fulfill her obligation to the online service. Margaret considered it a bullying tactic as well as financially unsound for an independent businesswoman like herself and stated bluntly, "I don't have to do anything but DIE." We howled with laughter (she won the argument, btw), but we also realized the truth in her words. Most things in life are negotiable and while we've done a fairly good job so far of emulating Margaret we're determined to try harder when faced with a similar situation. Moving along, this cluster of colourful homes is to the east of Bertra House. While these are just up the road. While we rented a car at the airport we did not expect the substantial distances between places nor Ireland's wide open spaces. 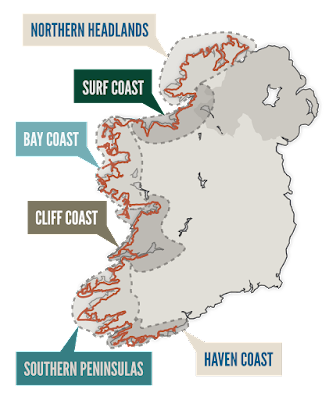 Unlike the UK's compactness with something new and different to see around every corner, Ireland is much like Canada and makes an automobile, at least on the west coast, a necessity. Our first day-long road trip took us west from Murrisk through Louisburgh to Delphi and eventually onto Aaesleagh although to be fair they were little more than names on a map than actual communities. The landscape, both bleak and haunting, made us feel slightly melancholy and only later did we learn the significance of the Doolough Pass. In 1849 during the potato famine between 400 and 600 men, women and children were told that if they walked from Louisburgh to Delphi Lodge they would receive help and food. In March of that year they made the journey only to be turned back by the Board of Guardians. On the return trek to Louisburgh many died, their bodies eventually buried by the authorities with no coffins, markers or ceremony. 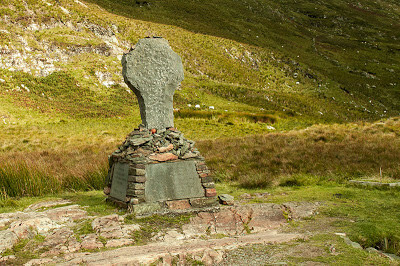 It became known as the Doolough Tragedy. A Celtic Cross was erected in their memory. Since 1988 a Famine walk along this route has taken place each May to remember the tragedy as well as to highlight the starvation of the world's poor today. Archbishop Desmond Tutu, children of Chernobyl and Kim Phuc (the Canadian woman made famous in photographs as a girl running naked and burned by napalm in Vietnam) to name but a few have done the walk. On the day we were there our only companions were sheep. The thorny evergreen bush with yellow flowers (we first saw it on Guernsey) is called gorse. Despite its tragic past there is a raw beauty to this place. Continuing further south we eventually reached the Delphi Lodge. Today it is a luxury resort offering adventure vacations. The Wild Atlantic Cafe is one of the few places to stop for a snack or cup of tea. It also sells souvenirs and local products. Just opposite the property is an old bridge that practically begged to be photographed. Eleven miles down the road is a river that calls to fishermen. There were three when we arrived. This is the view on the other side of the road and before I took the shot five motorcycles drove past. We stopped to take a selfie a little further along the road and realized the guys on the motorbikes were there. We made two attempts to take a selfie, both of which were dismal when all of a sudden one of the guys offered to take the photograph for us. Next thing we knew three of them decided to join us. We chatted for probably 10 minutes, and then parted company, but before they drove off they suggested we visit Achill Island. We did so on our last day in Ireland and are indebted to these guys for the tip. Our final stop of the day was The Tavern Bar & Restaurant just a short distance from the Bertra House B&B. Great pub, great food, and a super first day in Ireland.